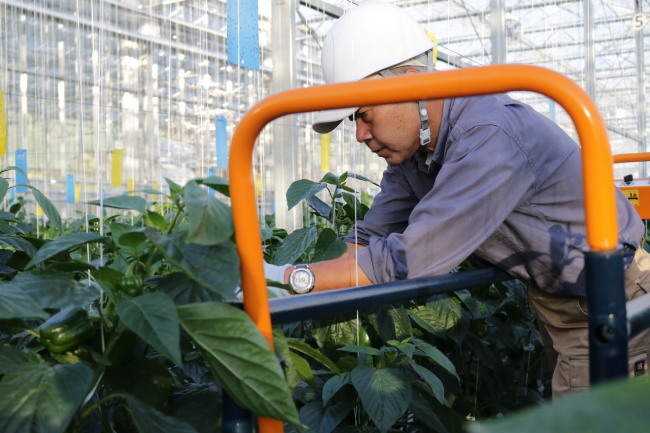 CHIBA, Japan -- To meet the pace of the aggressive growth of the indoor farming industry in China and the United States, both South Korea and Japan should bet bigger on industry innovation, a Japanese expert said. 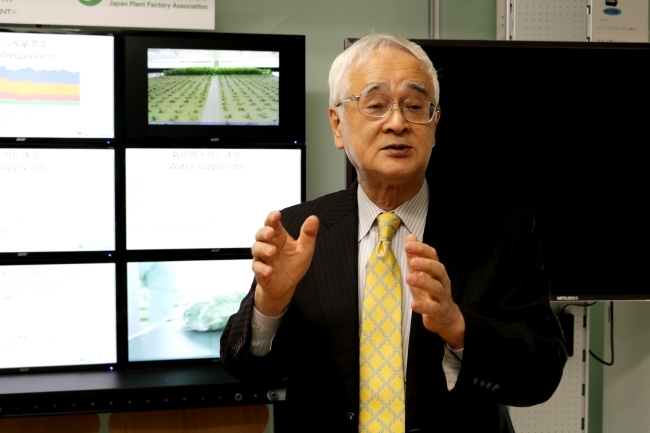 Toyoki Kozai, professor emeritus of Chiba University and president of the Japan Plant Factory Association, told reporters that Korea should spur efforts to invest in smart indoor farming technologies. His remark largely resonated with Korean corporations that have for years faced opposition from farmers. The 74-year-old Kozai added China’s interest in indoor farms stemmed from the need to grow herbs for cosmetic products, such as Chinese angelica root. Over recent years, Japanese tech giants have joined the race for investment in farms. After incorporating technology -- mainly from Dutch firms -- with their own tech prowess, some of the giants, including Panasonic and Fujitsu, gained the capacity to team up with advanced overseas business entities in China and Finland. 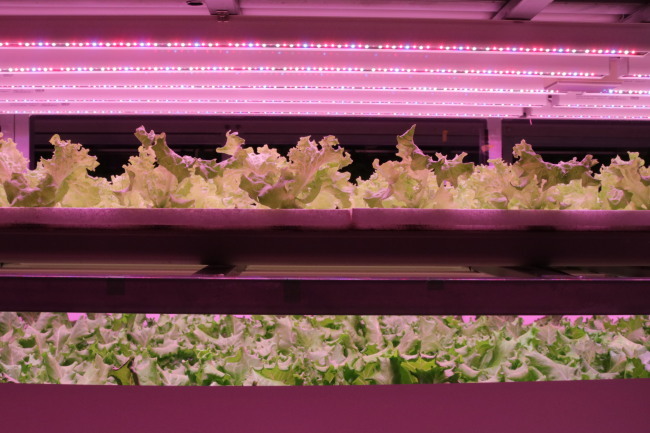 In addition, Softbank Chief Executive Masayoshi Son decided in July to invest $200 million in Plenty, a Silicon Valley startup for vertical farm technology. Despite such efforts, Kozai expressed concerns over the soaring volume of investments in China and the United States. An example is the $1 billion investment into factory farms by Sanabio, a joint venture between the Chinese Academy of Sciences and Chinese optoelectronics giant Sanan Group. Countries such as Singapore, Vietnam, Mongolia and Russia are also moving to establish and operate vertical green farms, Kozai said. In the wake of cost-saving light-emitting diode technologies, now is the best time to invest in indoor farming, according to Kozai. Currently, products grown in indoor vertical farms are 20 to 30 percent more expensive than those of conventional farms. JPFA, a Chiba University-affiliated vegetable factory operated across 10,000 square meters, uses solar light to grow tomatoes and strawberries, and artificial light for lettuce production. The nonprofit organization, headed by Kozai, has sought automation of the facility by amassing a database, while adopting hydroponics -- or soilless -- technologies. Combined with the advent of artificial intelligence, such progress is taking factory farming technology to new heights. For example, JPFA will be able to produce lettuce for heart disease patients by modifying lights, Kozai said. Following the success it had achieved in the artificial light growing development, JPFA has gained financial support from about 125 corporate members and 100 individual members, as of September. In contrast, Korean firms have long faced resistance from local farmers, who say the market entry of large businesses will infringe on their livelihoods. In September 2016, LG CNS, a software firm under the conglomerate LG, withdrew its plan to invest 380 billion won ($349.7 million) in smart farms on 760,000 square meters of reclaimed land in North Jeolla Province by teaming up with Turkish Advance International Group. This came three years after Farm Hannong, another agricultural firm currently owned wholly by LG Corp., was forced to cancel a project to build greenhouses on reclaimed land in Gyeonggi Province, due to farmers’ protests. SK Telecom has operated a smart farm in Sejong City on 8,264 square meters of floor space since 2015, while K Venture Group, affiliated to Kakao Corp., is holding 33.16 percent of Manna CEA, a maker of hydroponic and aquaponic products. However, industry watchers view the high-tech farming sector as being at the nascent stage. “Business penetration into agriculture has encountered a conflict of interest,” a source told The Korea Herald, declining to be identified. However, Kozai said Korea has the potential to stimulate farming factory growth, on the back of advanced light-emitting diode technology largely owned by local conglomerates, as well as Dutch technology-backed bell pepper farming capacity. He added that 70 percent of Korean bell pepper production is exported to Japan and dominates the market.